As usual at the beginning of each month, the latest update of the complete Specs Compound Library is available via the Specs.net website. Just login using your personal account details and download the library from the Available Databases directory on the 'Upload/Download' page. You have the choice to download our latest full libraries of Screening Compounds, Building Blocks, Natural Products, Pre-plated Libraries and special libraries like the ExAcD library (read more below). Our libraries are stored in compressed SD-file format. In case you don't have a personal account yet or would like an additional account for your colleague, just register as a new user and within 48 hours you will receive your personal login data. 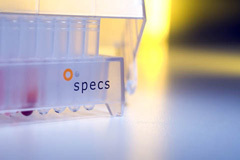 For more information on compounds available in smaller quantities (minimum amount 1 mg), requests on larger quantities then currently available or special libraries like the Exciting Academic Database (ExAcD), World Diversity set or a quote for a Consortium database, please do not hesitate to contact our sales department (info@specs.net).